I know the thought of anchovy pasta doesn't thrill all of you. That's okay... it was pretty exciting to me. I was thrilled to see this recipe in Food & Wine (April 2011) and couldn't wait to give it a try. Well, it took me a while, but recently when the lights were out after a big wind storm and the only thing working in the house was the gas range, I had the perfect dinner to make (and eat...) by candlelight. There is something very umami and special about the anchovies in this pasta that is not overwhelmingly salty or fishy. Perfect for a simple dinner with some good wine, like a nice crisp sauvignon blanc white wine. 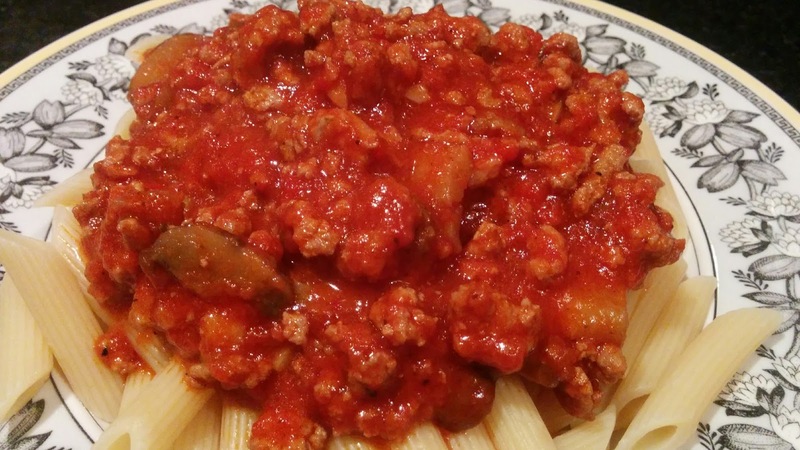 One trick that this recipe uses is adding some of the pasta cooking liquid to help with the sauce. If you've never tried, you really need to! 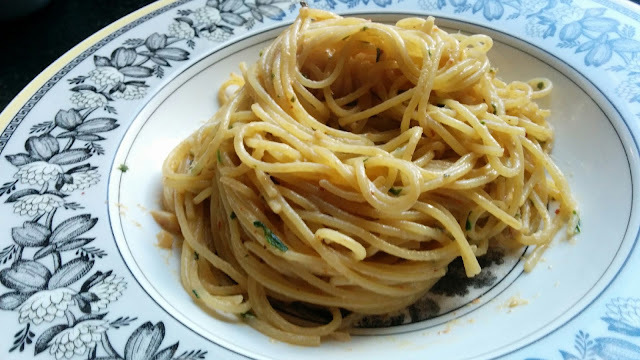 It works so well, here's the recipe that I like that I first tried this technique, Cacio de pepe. In a large pot of salted boiling water, cook the spaghetti until al dente. Drain the pasta, reserving about 1 cup of the cooking water. 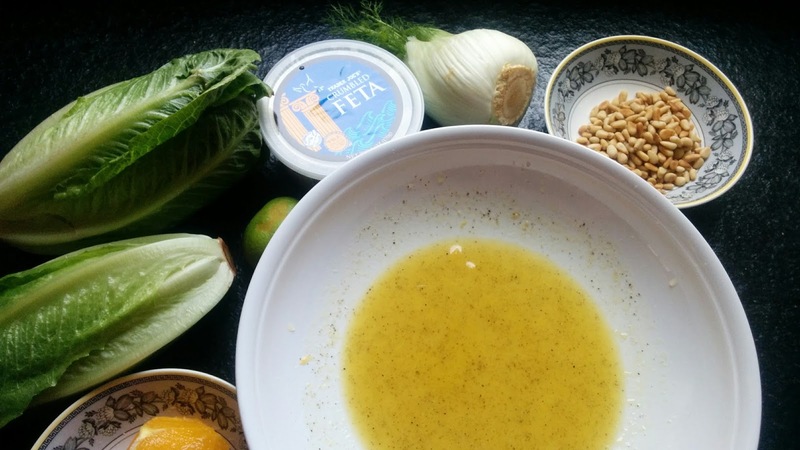 In a large, deep skillet, heat the oil with the garlic and anchovies and cook over moderately high heat until the anchovies have dissolved, about 2 minutes. Add the red pepper, zest, oregano and parsley, then add the pasta and toss to coat. Remove from the heat. 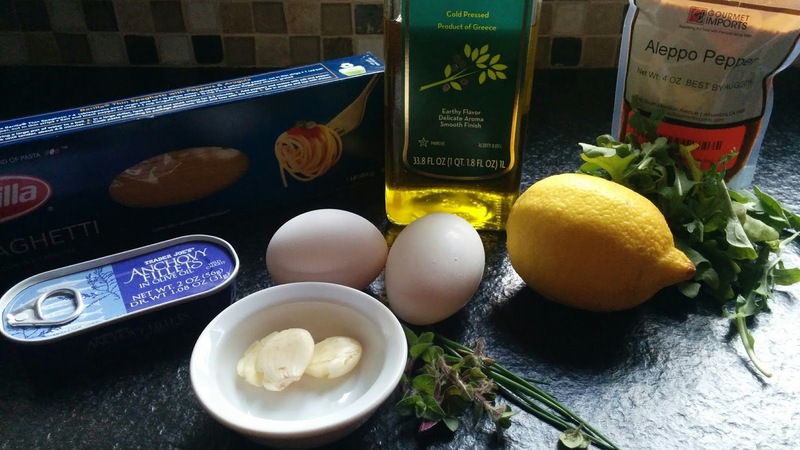 In a small bowl, whisk the yolks with the 1/2 cup of the reserved cooking water and add to the pasta. Cook over low heat, tossing until the pasta is coated in a creamy sauce, about 1 minute. Season with salt and pepper and serve. NOTE- Add a bit more of the reserved pasta water if the pasta seems too dry. Well, I missed Pi (3-14-16) day, it's the day every food blogger in town posts a pie recipe. I'm just too busy these days for all that mid week baking stuff. However, this recipe is easier than pie, and tastes just as yummy. First thing out of taste tester's mouth (that cute guy of mine) "Ahhh, that tastes better than pie!" Have I mentioned that his favorite pie is cherry? This tastes strong, but I did keep reminding the others who were sampling, that it was "half juice". Plus, you won't have to worry about scurvy or gout if you have one of these. Hahaha! NOTE- A jigger is about a 2oz measure, but you could use a 1/4 cup measuring cup too. In an ice filled shaker, add all the ingredients. 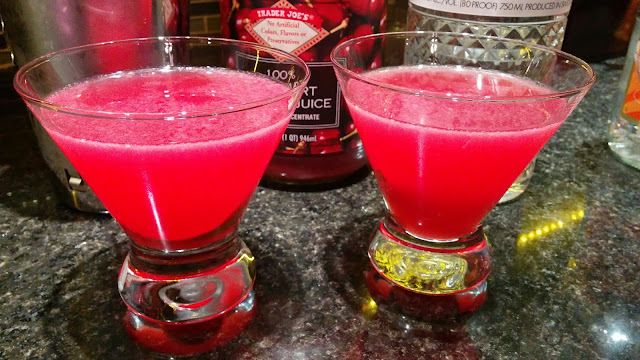 Shake, shake, shake and strain into martini glasses. 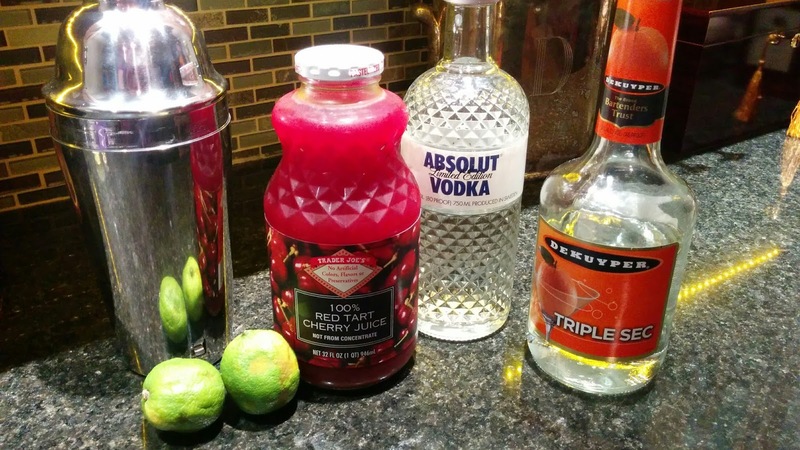 You could garnish with a cherry, or a wheel of lime, but really... it tastes so good, you don't really need a garnish. One of the yummiest things to eat while you are watching a movie, sports, or one of your favorite shows. 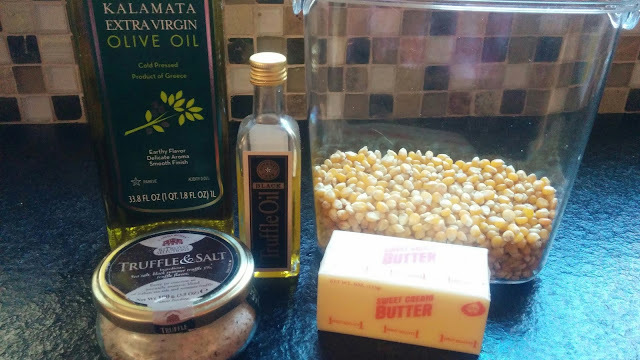 Since combining truffle oil and truffle salt with our melted butter on stove popped popcorn, we have never been back. This is now our favorite (only!) way to enjoy popcorn. 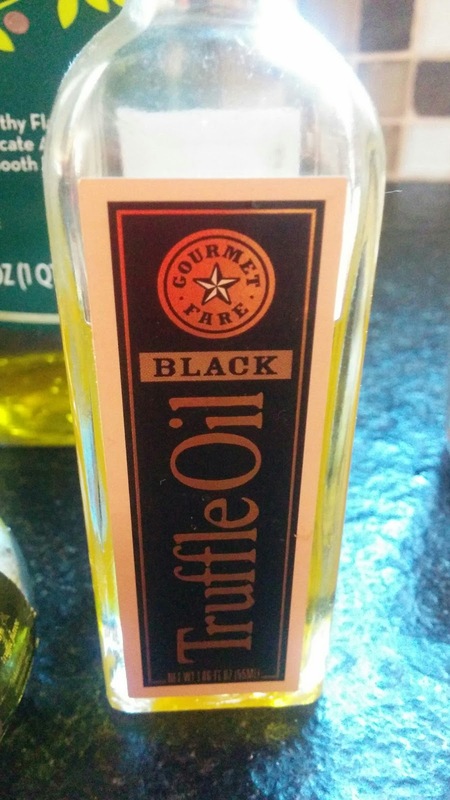 Also, I have found truffle oil at "Home Goods" and TJMaxx for half the price, so if you go to those places, run through and have a look. Never hurts to save a little cash. 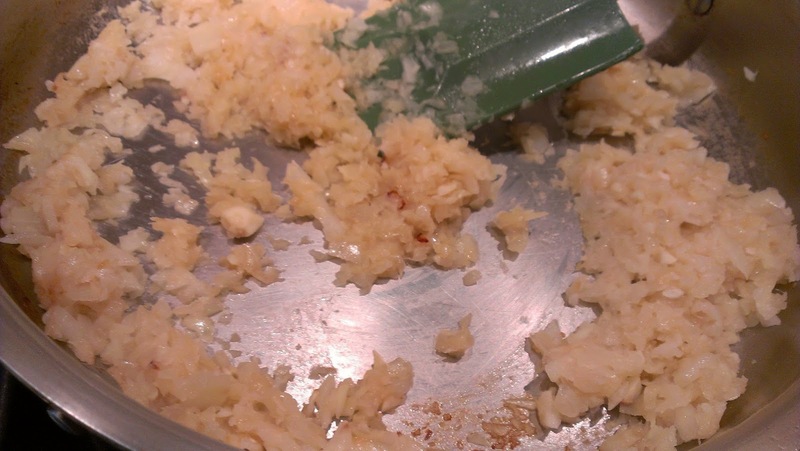 NOTE- If you really wanted, you could add some finely grated fresh Parmesan cheese, which is also quite delightful. In a medium dutch oven, with a lid, over medium high heat, add the oil. Let it heat for about 1 minutes and toss in the popcorn kernels. Add the lid and while holding the lid in place with pot holders, shake, shake the pan over the heat. Let sit for about 30-60 more seconds. Shake, shake, shake again. Let it sit for 30-6- more seconds. By now, you may have heard a pop, or two. Keep up the routine of shaking and letting sit for 30 seconds. 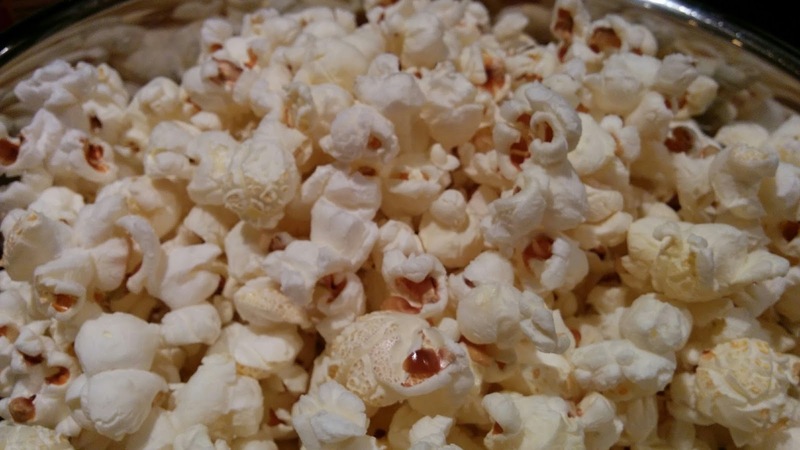 When the popcorn is starting to slow way down, pull it off the heat and add to a big bowl (or two if you prefer not to share...) Turn off the heat. 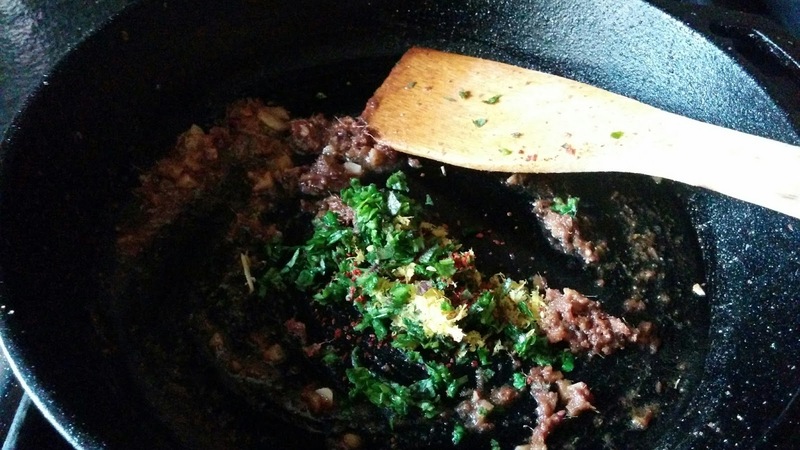 While the pan is still hot, throw in the butter and melt, adding about one teaspoon of truffle oil. Swirl to combine and drizzle all over the popped popcorn. Toss with a sprinkle, or two, of truffle salt and enjoy at once. Truffle oil and truffle salt will come in handy for lots of things like some of my other posts. Sometimes you see a recipe and think, yeah, I bet that is good. This is one of those. 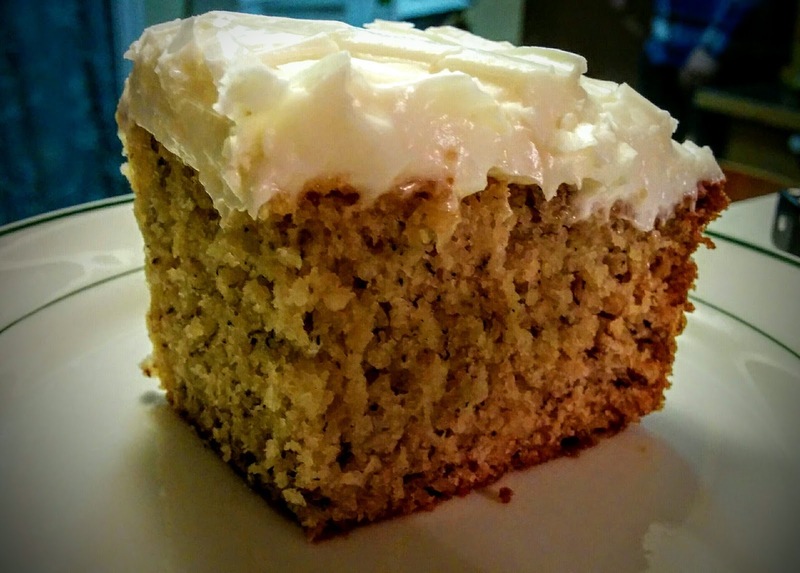 I saw this "Crazy Banana Cake" on this blog. I took this one to a family party last night and it was a hit even with those who normally don't like dessert, and even some "cake-haters". This one is so moist and delicious, that it is mostly instant love. I'm looking forward to taking this one to work very soon. 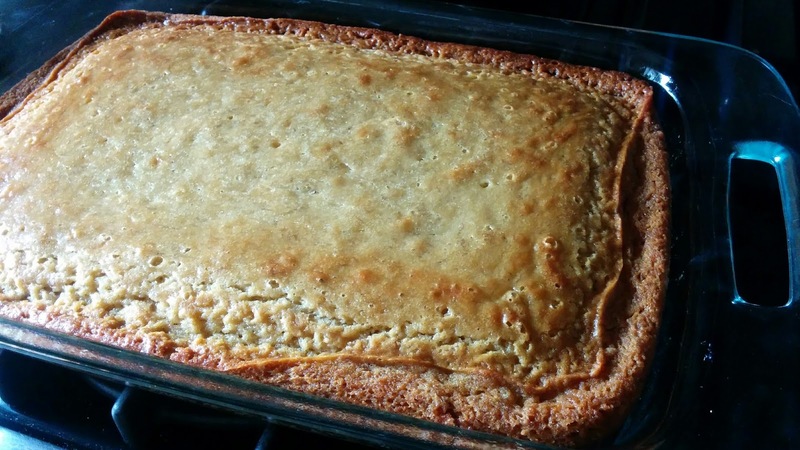 There are a couple of things that make this one "crazy", which are baking at a low heat and putting into the freezer right after taking out of the oven. What both these things do is help the cake be very moist. 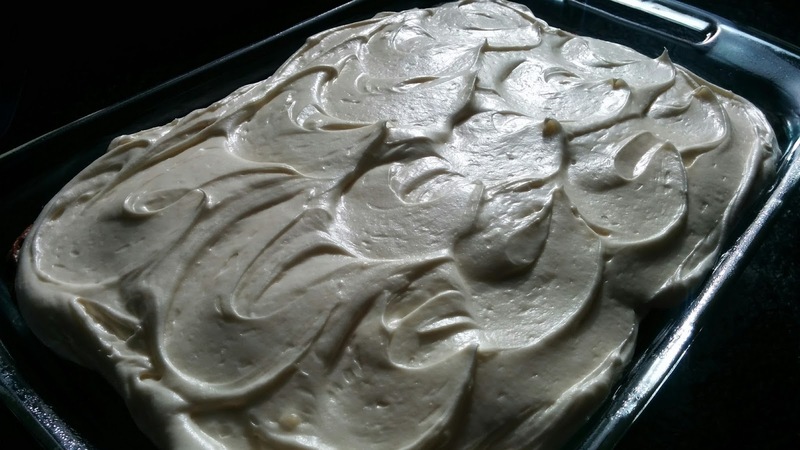 The cake never evens freezes in those 45 minutes, it just stops the cooking (which of course continues when you remove something from the oven) more quickly than letting sit on your counter to cool. You will notice in the ingredients that there are not any brown bananas showing. 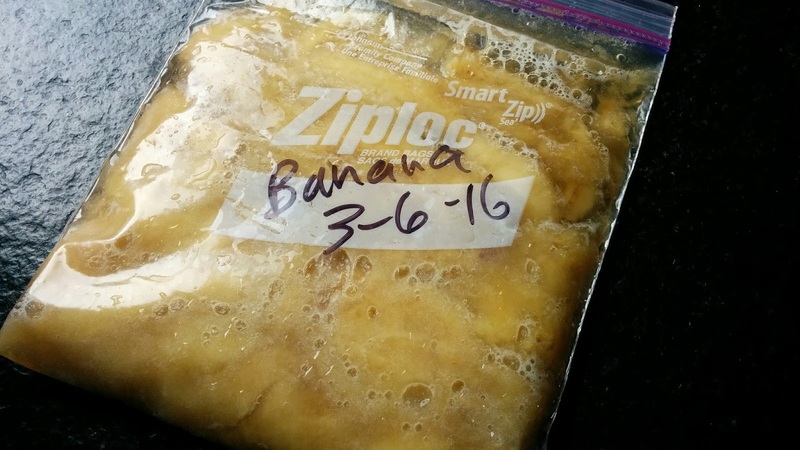 I bought my bananas a couple of weeks ago, but when they were delightly ripe for baking, I didn't have time to bake. So I threw them in a Ziploc and smashed them flat. Making them flat makes it super quick for thawing, plus they are easier to store in the freezer. 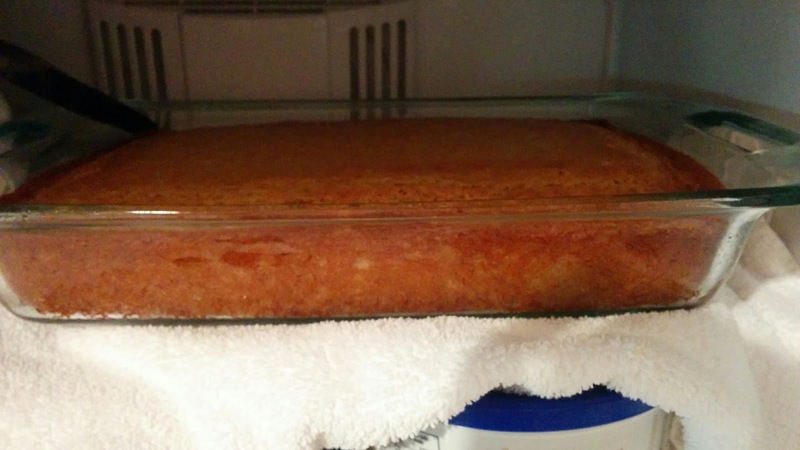 Pre-heat oven to 300º F, and grease and flour (or spray), a 9×13 cake pan (use Pyrex glass or a metal pan that can withstand the oven to freezer instructions. Mash banana and mix with lemon juice and set aside. In a med bowl, mix flour, baking soda and salt. Set aside. 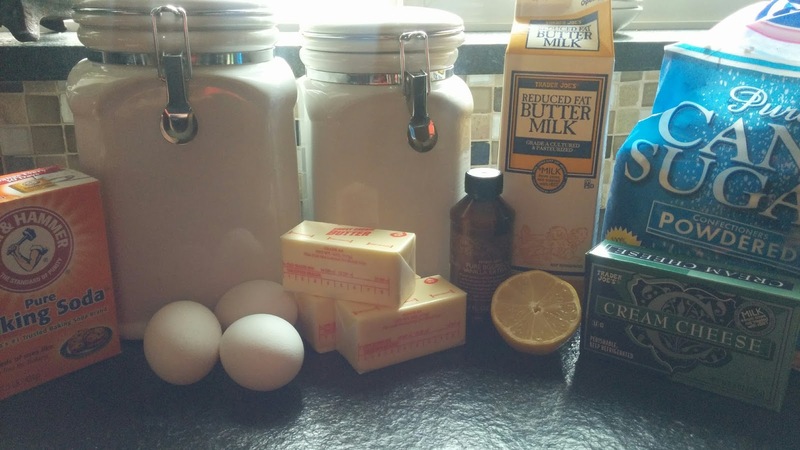 If you’re making your own buttermilk, combine milk and vinegar (or lemon juice) in a small bowl, and set aside. Beat in eggs, one at a time. Stir in vanilla. 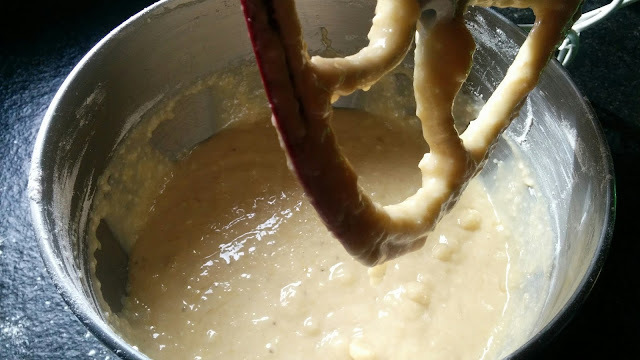 Beat in flour mixture alternately with buttermilk. Pour into greased/floured (or sprayed) cake pan and bake at 300º F for 1 hour, check to see that a toothpick comes out clean. Immediately place in freezer for 45 minutes. No need to cover the cake, but you’ll want to place it on a thick, folded towel to protect items underneath. (if not completely cool upon removal from freezer, let cool further before icing). Here's mine in the freezer. 8 oz cream cheese, room temp. Cream butter and cream cheese. Beat in vanilla and icing sugar on low until combined, then high until smooth. Ice the cake generously. Enjoy! I could use a little dose of Spring right now, what about you? 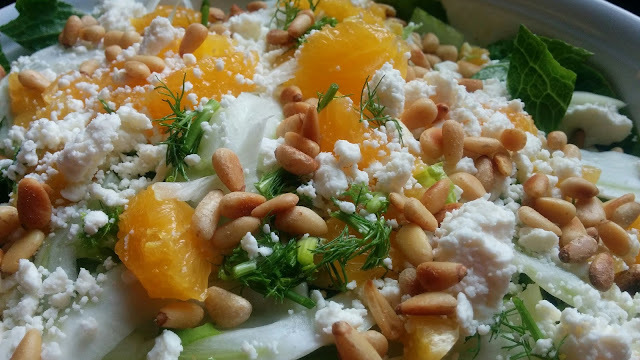 Here's a bright, fresh and crunchy salad that is easy to make, travels well in case you are taking it to enjoy at friend or family's house. Recently, I rushed to bring a salad to a lunch at my mom's with all my sisters. Honestly, I was going to stop and buy a bagged salad at the grocery store, I was just tired and a bit uninspired. Not much in the fridge, but once I had another look, I saw a slightly sad looking fresh fennel bulb that I bought at Trader Joe's recently. Now the thing about fennel is that is does last a long time and retains it's texture, but fact was, I needed to use this one up. Here are the ingredients before I started, I must admit, I didn't intend to blog this one, but it started to come together quickly so I decided to take some photos. Then, later after sharing with Mom and sisters (the biggest food critics) I decided this one was worth sharing. Prep the oranges by cutting the peel off the outside of the oranges, removing the white part too. There is some waste, but it gives you nice looking, easy to eat sections for the salad. 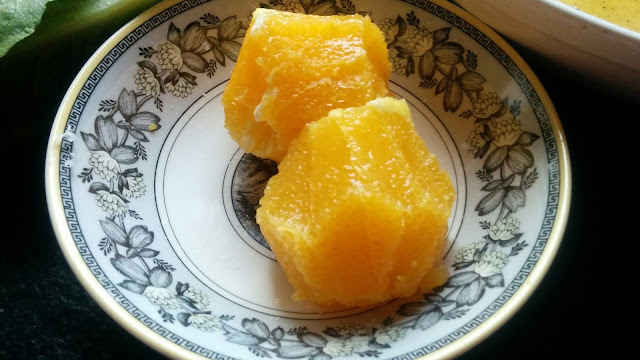 I squeezed the peels (which have lots of orange still attached on the inside to make the dressing*). 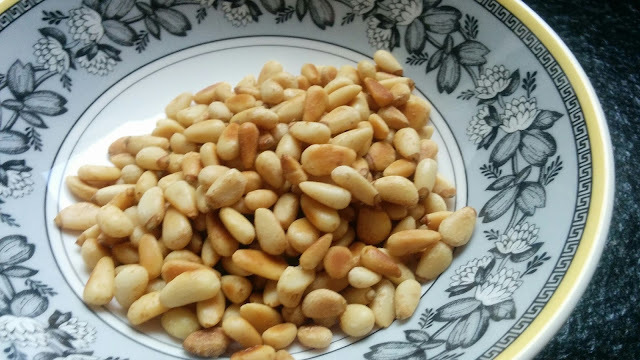 Toast the pine nuts over medium high heat in a fry pan, keep shaking them until they start to brown.It will take about 4-5 minutes, but be careful not to burn them. Remove from the fry pan and let cool. Make the dressing in the bottom of the salad bowl (you will build the salad on top it, tossing it before serving) by adding the olive oil, mustard, orange and lemon juices. Mix together with a fork, or small whisk. Add salt and pepper to taste. 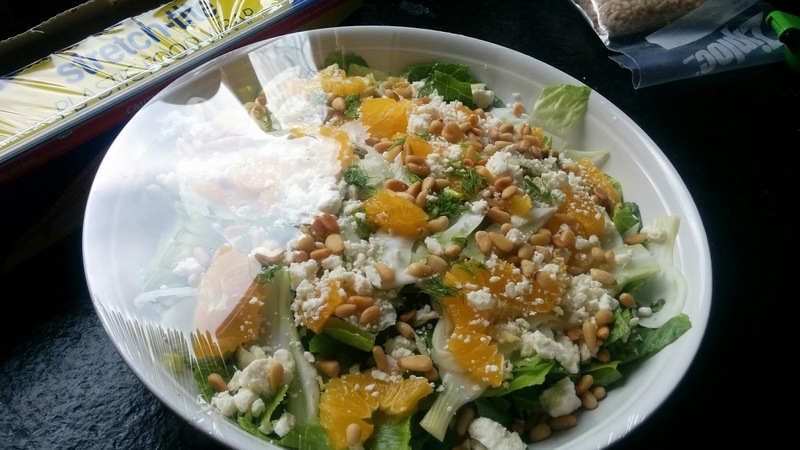 Add the chopped up romaine, then layer on the thinly cut fennel, the cut up oranges, fennel fronds (green part), crumbled feta and pine nuts. Cover with plastic and chill until ready to serve. I buy my pine nuts at Trader Joe's and I store them in a freezer Ziploc bag in the freezer between uses. My reason? I've had too many pine nuts go rancid when stored in the cupboard. What? You don't know what a rancid pine nut tastes like? Oh.... you will know, I promise. Buy them and immediately throw them into the freezer for a moment such as this. 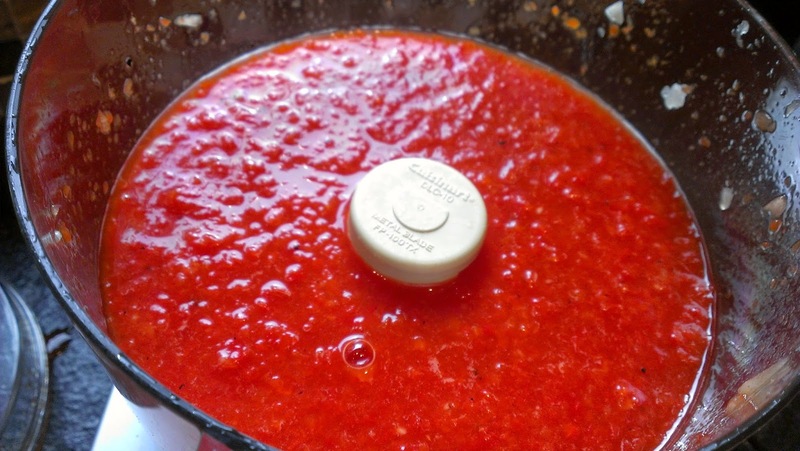 I still think about this sauce that I experienced over two years ago in Italy at a cooking class I took while there. 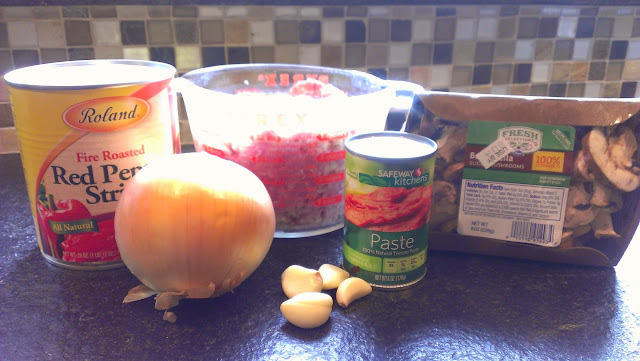 It was so noteworthy to me that the sauce was so simple- pork, wine, mushrooms, onions, peppers and tomato paste. Alessndro taught us that most Italian home cooks do NOT add a bunch of complicated ingredients but focus on 2-3 simple flavors to carry the dish. I've recreated it a couple of times at home. Here's my best reenactment of that recipe for the sauce. Well, as to the pasta, that will have to wait for another day! 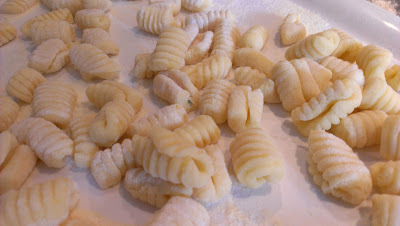 In the photo above is the pasta that we made at my Rome Cooking class (above), it's called cavatelli ("little hollows" or hot dog bun for short). It's a hearty pasta that holds up well to a thick and strong sauce. We rolled ours on a ridged wooden paddle, but you could use a flat surface too. I bought the paddles almost two years ago, but I still have not made these at home. 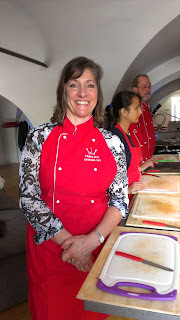 They were so terrifically yummy that I really need to do that. 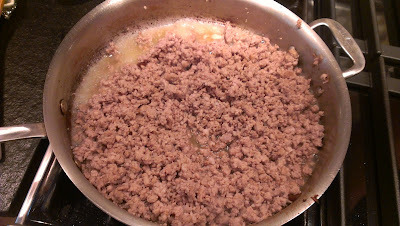 Marinating the ground pork in white wine may seem a bit strange, but I was taught this in my Roman Cooking class and I'm keeping it. Simple, yummy- why not? For the record, "ragu" means a meat based sauce, hence the brand name of Ragu out there on those silly store bought sauces. 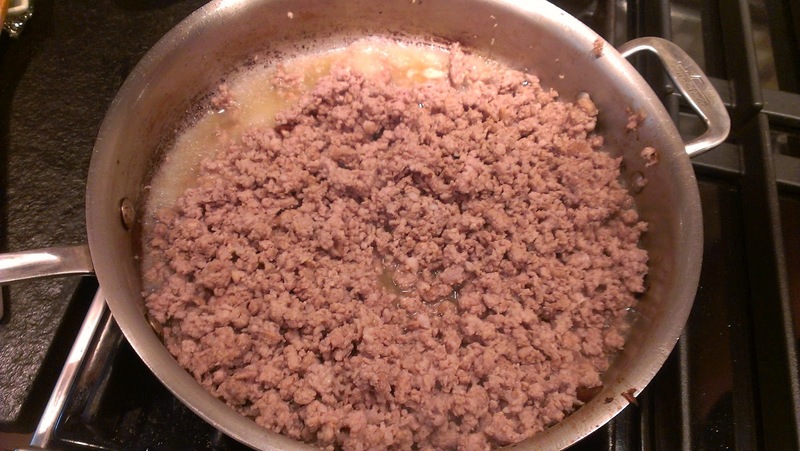 In a large bowl, add the raw ground pork and pour the wine over the top. Allow to marinate for about 30 minutes. Meanwhile, in a food processor, mince the onions and garlic. In a large skillet, add a little olive oil and brown the onions over medium high heat for about 10 minutes, stirring often. Set aside in a bowl. 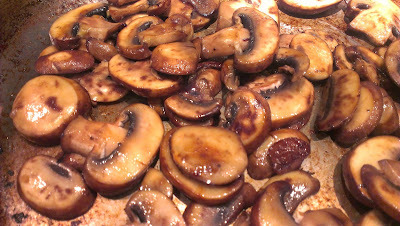 Brown the mushrooms in a little more olive oil over the same medium high heat for about 10-15 minutes. DO NOT add any salt to the mushrooms. If you do, they will not brown. Adding salt forces the mushrooms to release a lot of water and then steam, not brown. Set aside the mushrooms. Brown the pork over the medium heat, stirring often. This will take 20-30 minutes if you want to get some nice browned caramelized bits. Yes, the pork will be well cooked, maybe even overcooked, but it's important for the sauce. Add the pureed peppers, the onions, the mushrooms and the tomato paste. Stir to combine well over medium heat. Let simmer for 10 minutes, adjusting the season by adding salt and pepper to taste. You may need more salt then expected, as you have not added any salt during the rest of the cooking process. 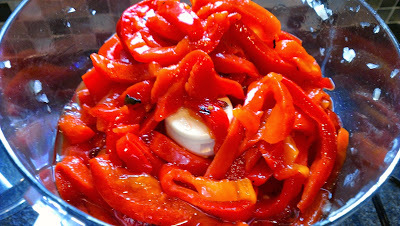 Here's the jarred roasted peppers before I pureed them in the food processor, and after in the photo below. It may take a while to brown up the pork. Drain the wine off before cooking.